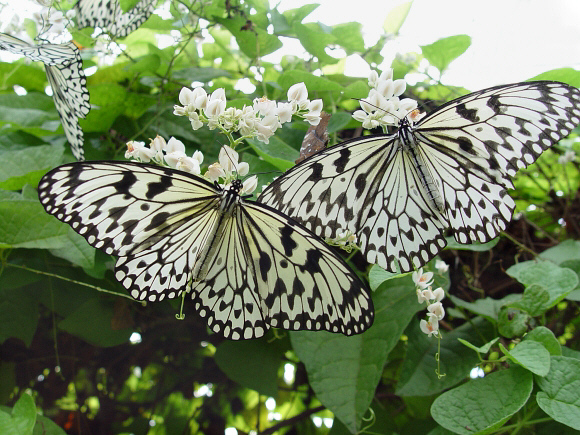 One of the most distinctive and easily recognizable insects in the Cockrell Butterfly Center is the rice paper butterfly (Idea leuconoe), also known as the paper kite and the large tree nymph. All these common names allude to the rice paper’s characteristic slow, graceful, and sometimes floppy flight. These butterflies make great, showy additions to butterfly exhibits and are therefore a widespread staple, found in most live butterfly displays. Rice papers are native to the forested regions of Southeast Asia. Rice papers make great additions to butterfly exhibits. Rice papers are related to the well-known monarch, both belonging to the subfamily Danainae and known to be distasteful to most avian predators by sequestering chemicals in their bodies from their larval food plants. 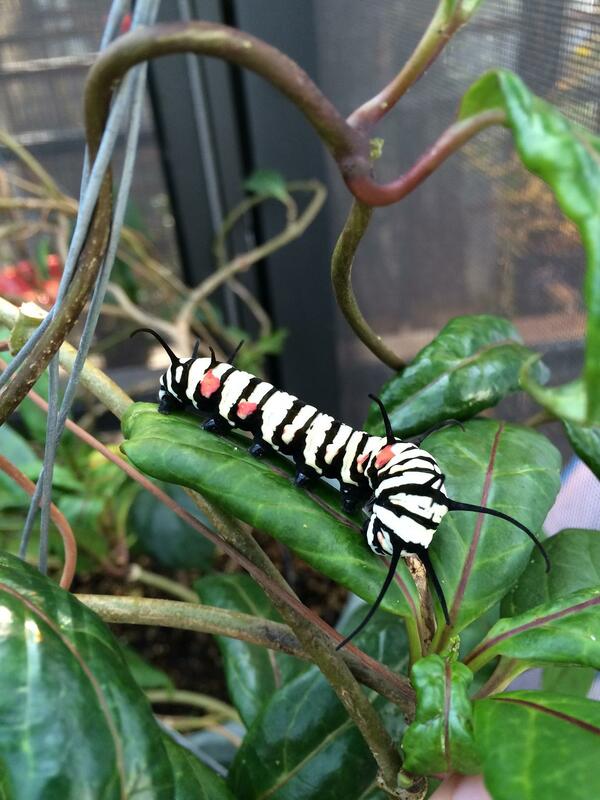 Monarch caterpillars eat milkweed to become unpalatable. Similarly, rice paper caterpillars feed on the milkweed relative, Parsonsia, to become distasteful. The monarch’s striking black-on-white and yellow coloring serves as a warning to potential predators. Rice paper larvae have a similar flashy coloration: black and white stripes with red spots. Contrasting colors on rice paper caterpillars warn predators to stay away. The rice paper life cycle begins with the female butterflies laying eggs on their host plant, Parsonsia. The eggs are small and cream-colored, usually laid on the underside of leaves. The eggs take about five days to hatch into tiny black-and-white striped caterpillars. The caterpillars first feed on their eggshell before directing their appetite to the Parsonsia leaves. The newly hatched larvae are too small to chew all the way through the thick leaves, so they create a circular trench as they eat the leaf epidermis. As they are eating they will extend their bodies and regurgitate yellowish foam distal to the chewed area. They continue this behavior until they have completely surrounded themselves in a ring of foam. This foam has been found to act as an effective ant repellent; ants will not cross the barrier. As the caterpillar grows, it “molts” five times in stages called instars. First through third instar caterpillars will exhibit this foaming behavior. Fourth and fifth instar caterpillars do not use regurgitated foam to repel ants. 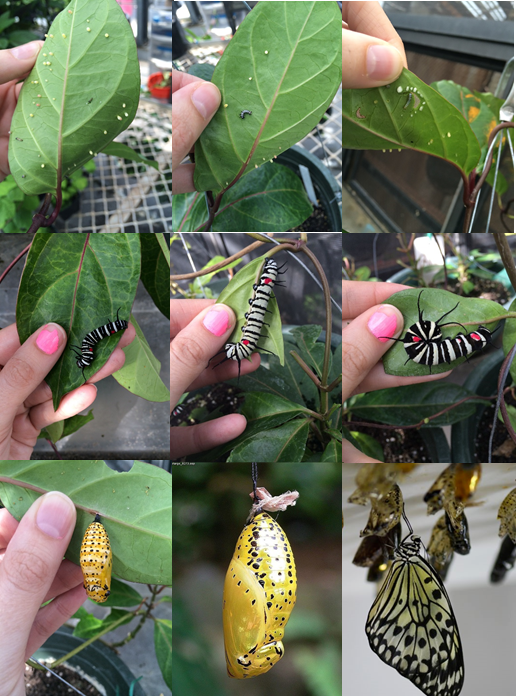 Stages of caterpillar development. The top-right image shows a caterpillar inside its ring of ant-repelling foam. It takes the caterpillars about two weeks of munching on leaves to reach pupation size. At this point, the caterpillars will find a safe spot to hang and form a “J” shape. They will then molt to reveal chrysalids that take about two days to completely dry. The chrysalids are a beautiful, shiny, metallic gold with black spots and swirls. Approximately 10 days later, the chrysalids pop open to reveal a brand new butterfly. The wet butterfly allows its crumpled wings to unfurl. A couple of hours later, the butterfly uses its newly dry wings to take flight and awe and educate museum visitors.